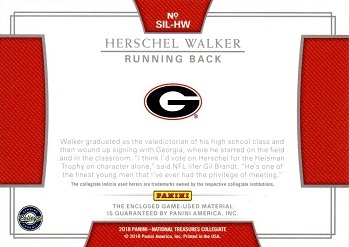 This is Herschel's entry in the 2018 Panini National Treasures Collegiate Silhouettes set. 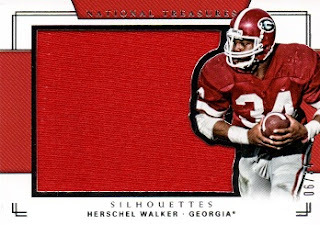 The cards feature a patch of game used material and in Walker's case, are serial numbered to 34, his jersey number. This particular card is # 6. There is also a Silhouettes Signature autographed version(described in a prior post) and a Prime Signatures edition, which is serial numbered to just 5.